Dordogne Caves Private Tours Include: Our Dordogne Caves tours include services of a professional driver guide; entrance tickets to Rouffignac and Lascaux IV caves, tolls, fuel and parking. Not Included: Entrance tickets to prehistoric museum as this is an optional stop. Your first stop on this beautiful private tour of Dordogne is the tiny village of Les Eyzies de Tayac, where France’s prehistoric ancestors made their home some 40,000 years ago. Located in the Vezere Valley, Les Eyzies is located one of the most beautiful and rugged areas in the country, dotted with unusual rock formations, dramatic cliffs and historic caves. The Dordogne caves are the most popular and well-known of the more than 100 archaeological sites in the area. 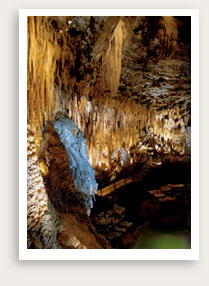 Your guide can take you to visit one or more of these caves, famous for their prehistoric artwork. Rouffignac Cave, which boasts more than 150 paintings of woolly mammoths and other ancient fauna, is several miles long, requiring a trip on an electric underground train to see the painted walls. Lascaux, perhaps the most famous Dordogne cave, is now closed to avoid further damage to its prehistoric “Sistine Chapel.” However, a visit to the reproduction cave, faithfully and painstakingly rendered by a team of artists and sculptors, is the next best thing. Time permitting and optional, you may visit the National Prehistoric Museum, which houses one of the world’s most complete collections of prehistoric artifacts.